Summary: He was going to lose the house and everything in it. lose his family. He stood inside the house and took stock. Everything in it had been taken for granted. How had that happened again? He had promised himself not to take anything for granted and now he couldn't recall the moment that promise had given way to the everyday. Right after I finished THE UNNAMED by Joshua Ferris, I was absolutely speechless -- and you probably know that I'm rarely at a loss for words. I adored each and every page of this book, and I didn't really want it to end. Having said that, I read the last 100 or so pages in one sitting because I could not put this book down. This is one powerful book! And that's why I'm torn with writing this review. On one hand, I loved it and can't wait to share it; and on the other hand, how in the world do I do justice to this novel? I finished this book many days ago and I still can't get the characters out of my mind. If that isn't an indication of a wonderful book, I don't know what is. Tim and his wife Jane have a somewhat typical (albeit very fortunate) life until one day Tim wakes up with an unexplained illness which causes him to walk (and walk and walk.) After numerous visits to specialists and tons of tests, doctors still have no explanation for this "disease." Tim has no idea when this disorder will strike and how long the episodes will last; and furthermore, he has tried to keep it all a secret from everyone except his family. As you can imagine, his behavior and his decisions have devastating effects on not only Tim but also his wife and daughter. As I read THE UNNAMED, I admit I wanted to know about Tim's illness and I felt the family's pain in desiring an explanation for Tim's behavior. But what I truly felt was so much more than just curiosity -- I was just in awe of the damage it wreaked on their lives. I couldn't get over the thought that life is so very fragile. It doesn't have to be unexplained illness like Tim's -- it could be cancer, a heart attack, a car accident, etc. that throws a family's world into turmoil. THE UNNAMED certainly demonstrates loud and clear how we should never take our lives or our loved ones for granted. What I also really appreciated about this novel is how the author portrayed Tim's and Jane's relationship. This book really caused me to think about the vows of marriage and what commitment really means -- that "in sickness and in health" vow is huge, and I don't think at 24 years old I had any idea what that could involve. My heart, of course, went out to Tim; but I was really affected by Jane and her reaction to his illness. I can't imagine dealing with his unusual behavior -- the worrying, the frustration, the care-taking, the exhaustion, etc. ; and on top of that, to not have a real diagnosis for his "illness" would have driven me crazy. Their love for each other and their commitment to their marriage was absolutely amazing. I have no idea how Mr. Ferris came up with the idea for this novel, but he's an absolute genius! And then to successfully pull off the idea of this very unique story is pretty darn remarkable. I was also amazed by Mr. Ferris' writing style and way with words -- he is one heck of a writer! I especially appreciated how through his writing, he was able to elicit such strong feelings in me. I haven't read Mr. Ferris' award-winning novel THEN WE CAME TO THE END, but I so want to now. I mentioned earlier in my review that I was rendered speechless by this novel. And in many ways, I think I just wanted to take some time to absorb this piece of literature. But on the other hand, I had so much I wanted to say about this book -- I really wish I could have called someone to talk about it. I THE UNNAMED truly is a perfect choice for book clubs who appreciate literary fiction. I am not exaggerating when I say that there are hours and hours worth of talking points in this book. Some of the topics for discussion include marriage, love, commitment, addiction, and especially mental and physical health. I also think that the characters in this novel and their actions will resonate differently with each reader. I would absolutely love to have the chance to talk about this book with others and see what they took away from it. I feel as if I only touched the surface of this novel in my review -- which is probably a good thing because I don't want to give too much away. I highly recommend this novel and I think it will be one of my favorites for the year. There is a great deal of depth to this novel and I truly believe that many layers of the story are supposed to be interpreted differently by each reader. Thanks to the publisher for sending me an ARC of this book. I read this book for the Reagan Arthur Book Challenge which Kathy/Bermuda Onion and I are hosting. If this book is any indication of the quality of books from the Reagan Arthur imprint, then this is going to be one heck of a great challenge! 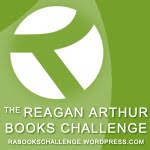 It's not too late to sign up, and you will be entered to win a six book prize pack of Reagan Arthur books. Please join us! Check out this fabulous interview that Amy Steele did with Joshua Ferris! A friend is going to send me her copy -- I can't wait to get it and start reading! I so want to read this! Everyone loves it. I haven't joined the challenge because I'm too poor for hardcovers, but when the books start coming out in paperback I suspect I'll start reading them. EW was so-so on the book, but every blogger that has reviewed it has been in the stratosphere over it. If you guys keep it up, I'm going to have to buy it on my Kindle. Excellent review though, you totally did it justice! What high praises for this book; it sounds wonderful. I plan to read this one as well for the R.A Challenge. Thanks for the great review Julie. Your review is wonderful and actually brought tears to my eyes when you wrote about what marriage vows mean. I need to read this book soon! Great review! I've thought about the sickness and health thing too - when you get married, and you're young and healthy, you never think what it will really mean to take care of someone with Alzheimer's or ALS or some other condition. Even "minor" conditions can put a strain on a relationship. Interesting topic!!! This almost made my book club's reading list but other books won out. The story does sound very unique and I plan to read it sometime this year. Do you think there'd be enough to discuss? Some reads are great reads but then there really isn't much to discuss. That was the concern of my book club. You did a fantastic job with your review! I felt the same way writing mine, that there was no way I could do it justice. Julie, you did it justice. Great review! Now THAT is some endorsement. Wow! I really want to read this now. I'd heard good things. I love books that keep you thinking even after you're done reading. skim, skim, skim ... I'm listening to this on audio, so I don't want to read your review until I'm done. I'm loving it though - the pacing is perfect to walk/run to. It's read by the author, too, who really puts his emphasis into certain words and passages. The Unnamed received an excellent review in our local paper--it's on my TBR list! Josh Ferris is an amazing talented isn't he. I linked to your review at my site where my link to my interview with Josh Ferris at The L Magazine also is.